The Collaboration on Social Science and Immunisation (COSSI) is an initiative of NCIRS and the University of Sydney. It was established in 2016 to better inform Australian immunisation policy and practice with high quality evidence from the social sciences by supporting capacity in research and evaluation, collaborations and translations. The COSSI network is open to researchers, health care providers and postgraduate students working in in the social science of immunisation. If you are interested in networking, assistance in methodology, learning from what others are doing and accessing further research-related information. The network does not accept sponsorship from the pharmaceutical industry. COSSI is governed by a committee consisting of researchers and program staff whom meet on a monthly basis. 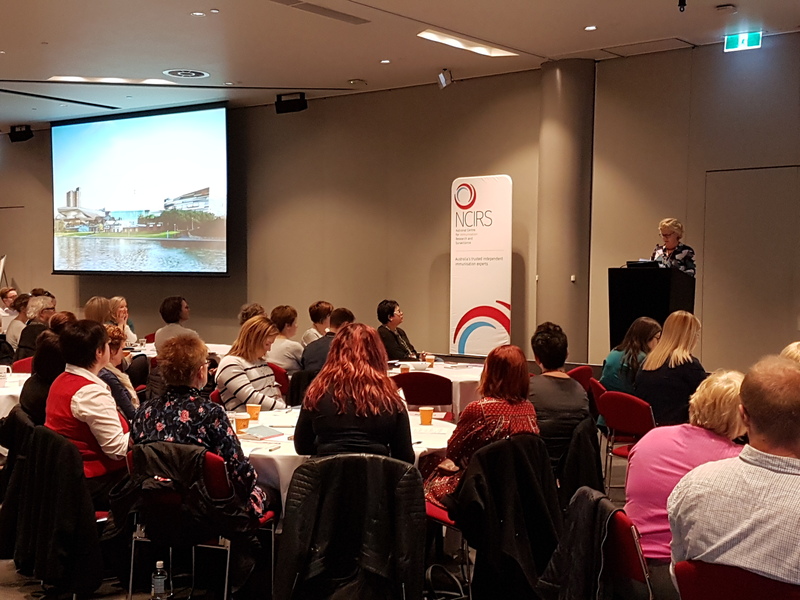 The Collaboration on Social Science and Immunisation (COSSI) hosted their inaugural full day workshop in Adelaide prior to the Public Health Association of Australia (PHAA) National lmmunisation Conference [LINK]. The workshop attracted a diverse group of 63 attendees from across Australia and even a few from New Zealand. The workshop was held for members and others interested in the social science of immunisation, which includes aiming to better understand community concerns, attitudes, barriers to accessing immunisation services, and experiences of obtaining immunisation care and support. It is hoped that by listening to issues and needs, improved resources for parents, health care providers and others in the community can be developed and effectively disseminated. Inequities can also be highlighted for action. The workshop was well received with 97% of evaluation respondents affirming that it was informative and useful. A Keynote presentation by Catherine Hughes (Light for Riley) was highly rated, while a landscape analysis and Table top session were also part of the program, and initiated lots of questions and discussion. “[The COSSI workshop] was the most valuable part of the [conference] week for me …[I suggest you] consider having a second satellite event after the NIC to synthesize learning’s from the conference and apply/translate into practical solutions to improve/ sustain confidence around vaccination programs in the community”. The National Centre for Immunisation Research and Surveillance sponsored the COSSI event and supported 5 members through travel scholarships. NCIRS also hosts the COSSI secretariat (including website) and has done since its inception in 2016. The network was co-initiated by NCIRS with colleagues at the University of Sydney. 2018 was another busy year for COSSI. We organised and hosted 3 Knowledge Exchange Meetings (KEMs) as teleconferences through the year. The most recent Knowledge Exchange Meeting featured Dr Jess Kaufman, Postdoctoral Research Officer, Centre for Health Communication and Participation, School of Psychology and Public Health at La Trobe University, Melbourne, Australia; who gave a short presentation about her work on the topic: Monitoring acceptance and evaluating strategies to promote vaccination – what, why and how to measure? As usual, some interesting discussion followed, with questions from immunisation practitioners, researchers, a communications specialist and others. The web-based videoconferencing tool Zoom was trialled in the recent meeting, to support the participation of international collaborators/members, and to enable recording of the meetings. COSSI Knowledge Exchange and Journal Club meetings have been planned bimonthly for 2019 beginning in February. The key objective is information sharing, discussion, solution finding and developing partnerships. We look forward to your participation. Join COSSI to be notified of future events. We acknowledge that the National Centre for Immunisation Research & Surveillance (NCIRS) is on the land of the traditional owners the Aboriginal and Torres Strait Islander peoples, the First Australians, and recognise their culture, history, diversity and their deep connection to the land. Together, through research and partnership, we aim to move to a place of equity for all. NCIRS also acknowledges and pays respect to other Aboriginal and Torres Strait Islander nations from which our research, staff and community are drawn. Our website meets the criteria for credibility and content as defined by the Global Advisory Committee on Vaccine Safety.